A NASA space telescope captured an amazing view of a new supernova, seeing the star explosion through the cosmic smoke of the relatively nearby Cigar Galaxy. 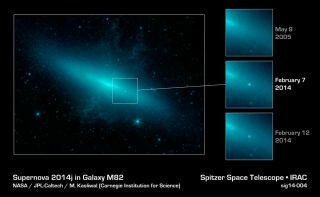 Spitzer possesses a distinct advantage in observing this supernova, however. Dust floating in SN 2014J host galaxy M82, also known as the "Cigar Galaxy," partially obscures observations in optical and high-energy forms of light. Since Spitzer sees in infrared light, which penetrates the dust, the space telescope can look directly at the aftermath of the stellar explosion. Supernovas occur when a star's material collapses into itself, causing a massive explosion.